Dr. Ponder and Galapagos hawk. The public is invited to a FREE workshop on Wednesday, June 3, 2015, which will give updates and presentations about the ongoing conservation work to address the problem of invasive species in the Galapagos Islands. 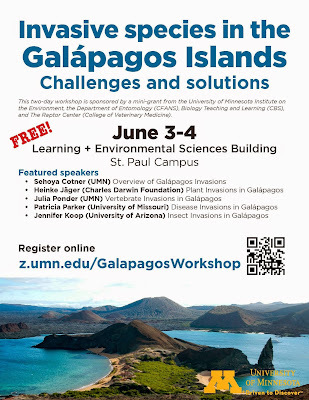 These informative sessions will be relevant to scientists, graduate students, and anyone interested in the preservation of this unique and incredible World Heritage Site. 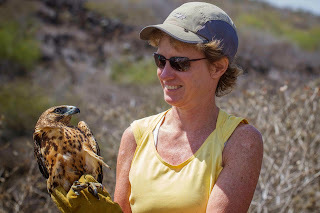 You might remember that The Raptor Center is a partner on this conservation project to prevent extinctions and restore altered ecosystems in the Galápagos Islands by permanently removing damaging introduced rodents from key islands. Already through this work, rodents have been successfully removed from eleven islands in the archipelago and the resulting recovery of multiple endemic species documented. Dr. Julia Ponder, executive director, and TRC staff focused on the endemic Galápagos hawks. Dr. Ponder is a featured speaker, presenting on "Invasive vertebrates vs endemics: Who will be voted off the island?" Information and registration on the website for the event is here. June 3 | 10 a.m. - 4:30 p.m. Already through this work, rodents have been successfully removed from eleven islands in the archipelago and the resulting recovery of multiple endemic species documented.